Backline is a term used to describe audio amplification equipment for bands behind the stage, such as amplifiers for guitars or synthesizers. Some bands and venues have expanded the meaning of backline to include other instruments for musicians, including bass guitars, keyboards, drum kits and other percussion instruments. It is used to discuss the needs of a band for an upcoming performance. 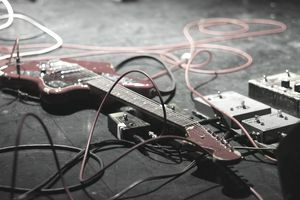 When a gig is booked, sometime before the concert, the agent, manager, or band should check with the promoter, venue, or club to discuss the backline needs of the band; the promoter will need to know what the band is bringing with them in terms of instruments, mics, and amps, and what the promoter will need to provide. The promoter will also need to know the technical specifications for the band. Exactly whose job is it to provide backline depends on how the show was booked and what size the show is. If a band has booked a show directly with a venue that they are promoting themselves, then the band needs to figure out what the venue can provide for them and make arrangements for everything else themselves. If a band books a show with a promoter, the promoter generally will make sure the backline is in place, although if the promoter has to rent equipment for the show, they will usually charge these costs back to the band. If an agent has booked the show with a promoter, then the agent and promoter should handle the backline negotiations. In some bases, backline equipment can be rented for touring or studio use, as many musicians prefer not to carry their instruments from location to location. Carrying such bulky equipment can be expensive, time-consuming and carries the risk of damaging necessary items. Many companies offer comprehensive backline supplies, including items not traditionally considered backline, such as instruments. With advance notice, companies can usually get additional equipment if needed. Major cities have their backline suppliers, with some national chains offering discounts of bands with multi-city tours which need equipment in each location. Companies typically offer guitars, bass guitars, bass amplifiers, keyboards, modules, drums, cymbals, percussion instruments, accessories, staging equipment such as lights and more. Renting backline makes travel easier and less costly since huge batches of equipment do not need to be shipped. However, it can pose some unique challenges for musicians. For instance, if a musician is used to the feel and sound of a particular guitar, switching to a new one off of a company's inventory list can feel strange and could even affect the guitarist's performance. It is why some bands travel with their essential equipment, such as guitars, and rent the other materials. While the term backline has been broadened to include a wide range of musical equipment, a backline has always been essential to a band's success. Understanding backline and the unique needs of the band and the setup of the venue is imperative in planning a successful event or show.